On my first proper foraging trip of the year, walking in the wood’s dappled light, I bagged a few handfuls of young and juicy wild garlic leaves. For those new to foraging, wild garlic is easy to spot emerging in the just-wakening undergrowth, all vivid green leaves and pungent scent. For whatever reason it seems especially prolific this year. I was hard pressed to put my scissors away and go home. Although there is plenty of wild garlic in my local woods, and no one else seems to be bothered with it, I try to resist cutting too much at one time. It is so delicious in quick recipes that it would be easy to get carried away and put it in everything. Unlike cultivated garlic, the wild variety doesn’t need much thought, prep or cooking to make an impact. Just wash and chop. I have been adding the tips of the leaves as a tasty garnish as well as adding it at the cooking stage. Today’s recipe, in which wild garlic features heavily, is one I am fairly confident will be a winner with you. The basic recipe is part of my DNA. I have been making it for about 35 years. Backstory time. I was born in Nashville, Tennessee and grew up in Florida. Other than fresh tomatoes, watermelon and snap beans, I was pretty much raised on cornbread. Of every recipe that the South is known for, cornbread is probably its finest. It is still one of my very favourite foods. My Scottish husband’s, too. Childhood summers for me were often spent at my Tennessee grandparent’s farm, picking just-ripe vegetables and trying to avoid being pecked by the crotchety rooster. If we weren’t helping with a harvest, my sister Julie and I would come in sweaty from whatever adventure we had that day – exploring the buried ice house, finding old arrowheads, panning (unsuccessfully) for gold in the creek, trying to tame the fluffy barn kittens. And we would be absolutely starving. After stripping off our dusty/muddy clothes Julie and I would dutifully wash our hands (and arms and legs and feet! ), then help get dinner ready. Usually we would be tasked with – yawn – peeling or stringing something. But sometimes we might be trusted to watch through the old oven door for when the cornbread was risen and golden. A very important job. I never heard a timer go off in Mimi’s kitchen. It was all instinct, experience, and perhaps a 10-year old helper. This recipe is based on my Mimi’s original. She used pure, local buttermilk, poured from a gallon jug (which she would get through in a week). For yourself, use buttermilk if it’s available, thinned down yogurt, or milk with a squeeze of lemon juice added to sour the milk. As for the cheese, the Roquefort is not vegetarian so you may wish to use a strong hard cheese of choice. Make it something punchy and flavourful. Also, we can’t easily get the same cornmeal as is available in the southern US, but Natco Corn Meal (specialises in Asian ingredients) is pretty good for cornbread. and polenta cakes. If you wish to make it vegan, use this cornbread recipe from Food 52, although I’m not sure about all that sugar – ugh! Add a rounded quarter cup of nutritional yeast flakes instead of the cheese for the essential umami flavour. A good pinch of white pepper, too. When mixing, add the wet ingredients to the dry and use a metal spoon to mix just until the dry disappears – you may still have some lumps. Cornbread is best eaten fresh from the oven, but will stand rewarming once. Wrap loosely in foil and reheat at 180C/350F for about 8 minutes. It’s also nice split open and lightly grilled/broiled. Enjoy this easy, deeply savoury bread with any stew, soup, chilli, breakfast eggs, hearty salads and much more. I really urge you to make this. It’s utterly delicious. Are you tempted to make this soon? What will you have it with? Did you grow up eating cornbread, too? 1. Add the butter or oil to a 10-inch skillet or baking pan and place in a 200C oven. Don’t leave for longer than a few minutes. You could also heat this on the hob. 2. In a medium bowl, stir together the flour, corn meal, baking powder and salt. In a separate bowl, combine eggs, milk and oil. Make a well in the dry ingredients and pour in the egg mixture, the cheese and wild garlic. Stir just until moistened (may be a bit lumpy – that’s okay). 3. Remove the hot skillet from the oven, swirl the melted butter and pour in the cornbread mixture, smoothing lightly with the back of a wet spoon. Sprinkle over a little bit of extra cheese if you wish. Return the pan to the oven and bake for 15 to 20 minutes, (18 is usually perfect) until risen, golden and starting to pull away from the pan around the edges. Allow to cool for five minutes then cut into wedges and serve warm. 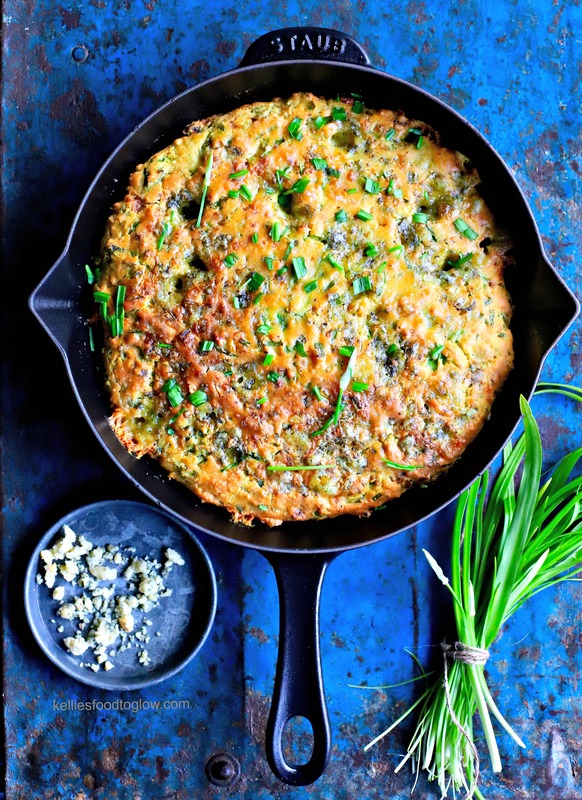 Looks delicious…My husband makes fabulous corn bread, but this looks like a good swap of ingredients, and never thought of the blue cheese and garlic…can’t wait to make it. This cornbread looks amazing, a perfect brunch idea with the friends! It would be great on a brunch menu for sure. I’m thinking with a shakshuka kind of thing maybe? Thank you, Elaine. Feel the fear and do it anyway 😉 And share, of course. I’ve not tried to freeze it. Love, love, love the looks of this, Kellie. I wish you could come over and make me a batch, but I’ll have to settle for making my own. Pinned and shared, of course! Scapes are wonderful, aren’t they? Too fleeting, which makes them even more special. What else does she sometimes put in her cornbread? You paint a vivid picture of your childhood – I can imagine you running from the crotchety rooster! If you can’t get your hands on wild garlic (short supply in the desert!) what would you use? Oooh, lovely! No I didnt grow up with cornbread, in fact you introduced it to me 🙂 This looks like a combo made in Heaven, fantastic! Making this for the second time today (and hoping to take a picture this time). First time I made it with cheddar cheese as it’s what we had and had it with chilli. It was awesome! Just picked another stash of wild garlic so going try it again today with roquefort. Watch this space!